Preheat the oven to 400°F. Line the bottom of two 12"x18" sheet pans with parchment paper. Put the water, salt and butter in a medium saucepan and bring to a boil over medium heat. Add the flour gradually, stirring continuously until a ball forms and comes away from the sides of the saucepan. Remove from heat. Put the flour mixture in the bowl of a stand mixer fitted with the paddle attachment. NOTE: Do not use the whisk attachment; you do not want to incorporate air. Beat on medium speed for 1 minute to allow the steam to evaporate from the mixture. Reduce the speed to low. Add the eggs one at a time until fully incorporated. The mixture should appear smooth and shiny. Using a lightly oiled tablespoon to scoop, place the cream puff batter on the prepared sheet pans, spacing them about 1 1/2 inches apart. Brush the tops with the additional whisked egg to glaze. Bake on the middle shelves of the oven for 10 minutes. Rotate the pans 180 degrees and reduce heat to 325°F. Bake for an additional 15 to 20 minutes until the cream puffs are a deep, golden brown. Let cool completely on the pans on wire racks. 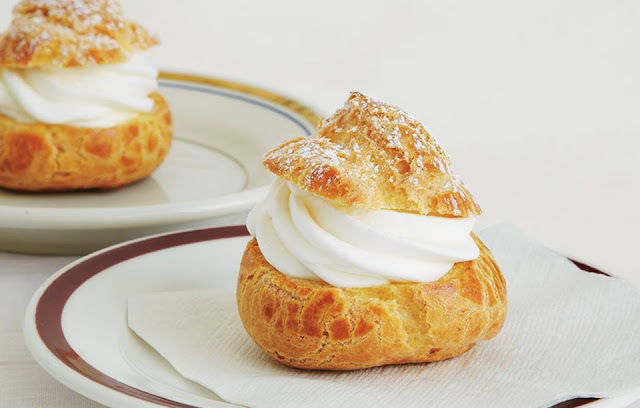 When cooled completely, horizontally slice the cream puffs and fill with fresh whipped cream or ice cream in whatever flavors you wish. If vanilla ice cream, dust with cocoa powder to finish. For other flavors, you can create your recipe by using other “dusts”—vanilla powder, fruit powders, etc.